With the new extension it saves feed and prevents the ground becoming contaminated. Due to the design of the feeder extension it makes it also ideal for water fowl and can be closed at night by just flicking the door shut on the end of the extension making it rodent proof and keeping the feed clean and fresh.The Emperor Feeder is made from a durable UV stabilised recycled Polymer and has a capacity of 70 litres. Its design allows feed to flow smoothly without clogging and uses a unique rainwater capture system. The feed dispenser is made form robust Glass Filled Nylon 6 and is resistant to badger attack and UV damage. Suitable for use in pens, open woodland and moorland locations. 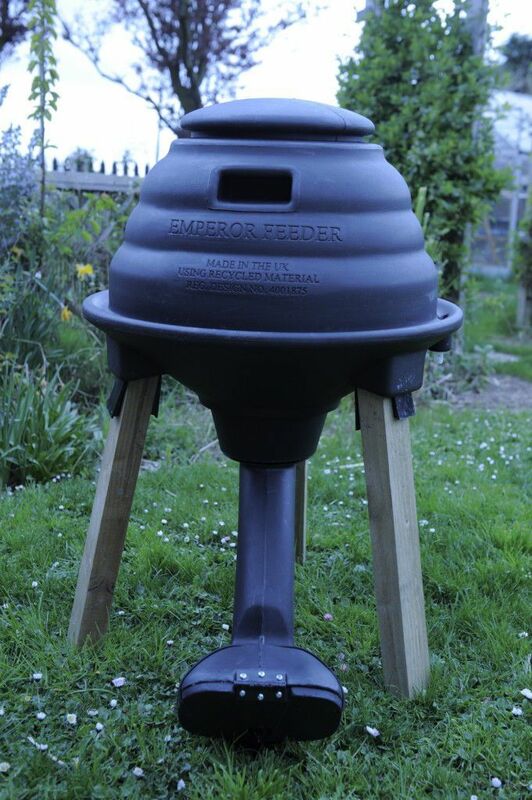 The Emperor Feeder is made from a durable UV stabilised recycled Polymer and has a capacity of 70 litres. Its design allows feed to flow smoothly without clogging and uses a unique rainwater capture system. For bulk feeding, Gamekeepers and Breeders have traditionally set up re-used chemical drums or barrels which have been far from ideal as they invariably have flat bases causing feed to build up at the bottom outside edges where it quickly deteriorates unless carefully cleared on a regular basis. 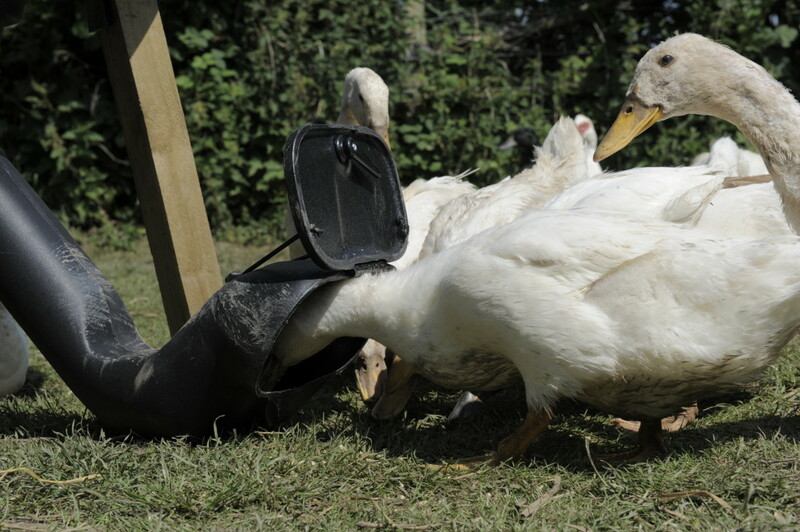 The Silo Design of the Emperor Feeder ensures that feed loaded into the top will always fully cycle leaving no dead areas for feed to be trapped. 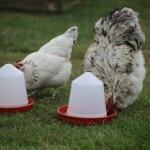 The Silo Design of the Emperor Feeder ensures that birds consume feed that is always fresh. In addition, the rainwater drainage tube diverts water away from the feed area avoiding feed contamination. 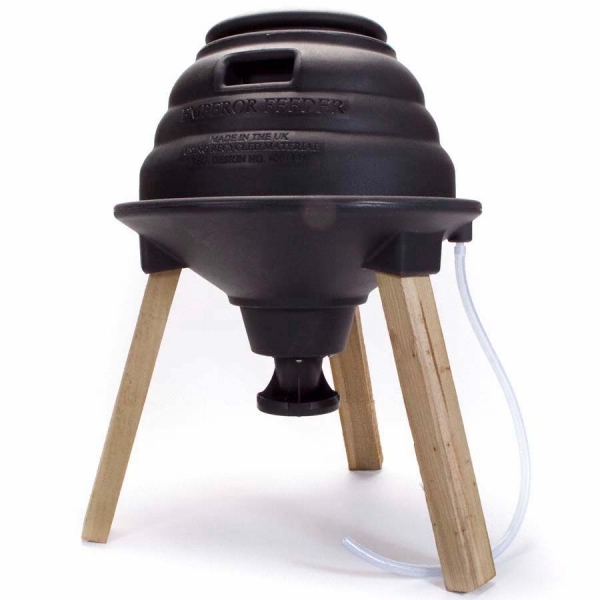 The Emperor Feeder is light and easy to handle and is equipped with a strong, water tight lid with a robust push click fit which is the right size and height for convenient filling. The Emperor Feeder is also designed so that the position and angle of the legs provides optimum stability. The entire assembled unit is inherently stable as the centre of gravity is low in relation to the leg footprint even when full. In addition, because different game species are comfortable with different feeding heights, the Emperor Feeder has legs that are easily adjusted. As they are made of tanalised wood they can be sawn to the required length or, for smaller adjustments, the leg wedges can be fixed at different positions. 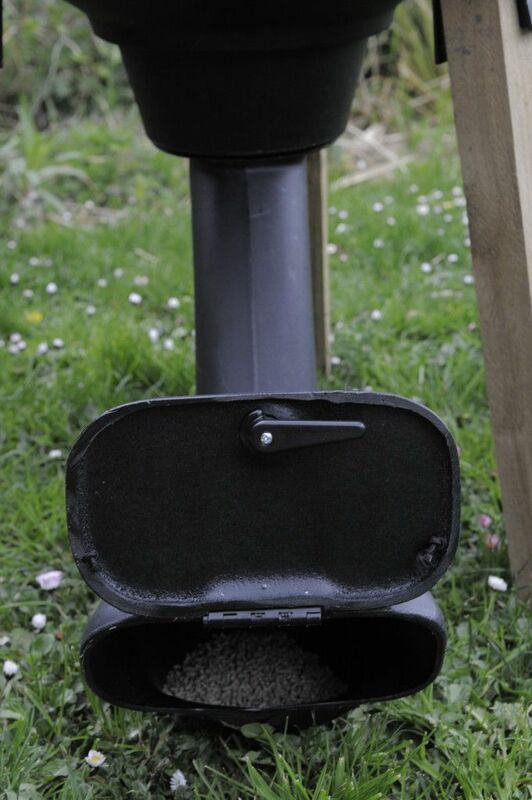 With Bulk Game Bird Feeders, the area most prone to Badger attack is the dispenser so the Emperor Feeder Feed Dispenser has been designed with a substantial wall thickness manufactured out of a heavy Glass Filled Nylon 6 material capable of withstanding significant abuse. Despite its inherent stability, under continued and persistent attack, the Emperor Feeder could be dragged over. However, in this event the rugged lid, with its robust fit, is unlikely to be prised open and the dispenser would only discharge feed that is in the plate area. As this rugged Dispenser is attached to the body by four substantial anchor screws, it is doubtful that it could be ripped off. Manufactured from heavy Glass Filled Nylon 6, The Emperor Feeder Feed Dispenser is designed to withstand long term UV exposure and is non-corrosive. It is anchored to the main body using 4 large anchor screws and the unique cone feed system allows for a wide variety of feed types to be dispensed without clogging. It has 4 feeding compartments and an auto clean and drain design allowing dust to be dropped out of the feed area and rainwater to run off around the bottom edge of the rim. The Polymer used is non reflective minimising distress to timid birds. 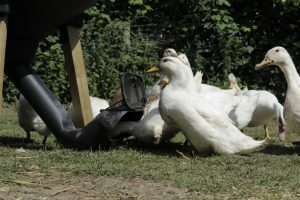 Be the first to review “The Emperor Feeder with Duck Feeder Attachment” Click here to cancel reply.